Safflower was used to dye the red cotton tapes of legal documents and it is the source of the expression “Red Tape” (see Liles). 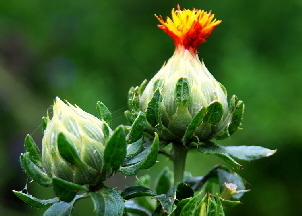 Safflower is one of man’s oldest crops and its flower petals were used as a dye in India, the Far East and Egypt. Indeed the name Carthamus comes from the Arabic, and means “dye”. It produces both red and yellow dyes that can be extracted from the flower petals, although the reds are more important. More recently the plant has been cultivated mainly for the oil, extracted from the seeds, that is used for cooking and in the production of margarine. The seeds are also used for bird seed. Safflower is a branched herbaceous thistle-like annual, growing to 30 to 150 cm tall, with globular flower heads that are brilliant yellow, orange and red. The hermaphrodite flowers appear from August to October and are pollinated by insects. Collect the petals a few at a time and dry them carefully. The seeds ripen from September to October but if safflower is planted too late, the seeds may not mature. Sow the seeds indoors with some heat in the spring. Transplant outside after the risk of frost has passed as this plant is very susceptible to frost injury. Safflower requires a sunny position but it can grow in poor soil. You will need equal weights of dried petals and fibre. Safflower petals produce two low quality yellow dyes and a good, although not very lightfast, red dye which ranges through pinks, rose and crimson. The first yellow dye should be washed away in cold water. Only then can the reds be extracted first in an alkaline and then in an acidic solution. The reds are suitable for silk and cotton and do not require the use of a mordant. Silk takes up both the red and the second yellow dye, turning orange, whilst cotton takes up only the red. Liles and Dean describe a lengthy process for extracting and using this dye.